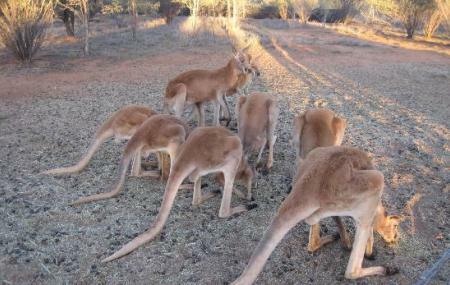 The Kangaroo Sanctuary stretches over a 90 acre piece of land that is home to about 25 Kangaroos. The sanctuary is well maintained and gives its tourists an opportunity to enjoy a stroll amidst the national animal of Australia. The experience you get at the kangaroo sanctuary is sure to blow your mind. Guided tours are available to the sanctuary. Wear closed shoes to walk around the sanctuary. The weather is pretty hot, wear a hat and carry sunscreen. Love this? Explore the entire list of places to visit in Alice Springs before you plan your trip. Fancy a good night's sleep after a tiring day? Check out where to stay in Alice Springs and book an accommodation of your choice. How popular is The Kangaroo Sanctuary? People normally club together Mount Gillen and Road Transport Hall Of Fame while planning their visit to The Kangaroo Sanctuary.